Published on February 1, 2009 in Internet Tips and Tools and Video Marketing. 0 Comments Tags: 1 percent improvement, Marc Dussault, You Tube, YouTube. Published on November 24, 2008 in Blogging, Lead Generation and SEO. 2 Comments Tags: 1 percent improvement, Blog, Linked In, LinkedIn, Marc Dussault, Reading List. Today’s post is about a little known Linked In tool you might want to consider, it’s called the Reading List – it’s a list of books that you’re reading that LinkedIn maintains within your profile. With a 5,000 word comment field, I am sure there is a lot that can be done with it. I am currently testing it with my first submission with a blatant self-promotional comment that I will edit later on. For the time being, this is a ‘new’ option to consider if you’re looking for that extra 1 percent improvement. If you don’t know what www.LinkedIn.com is, you really need to subscribe to one of our Memberships, you can start off with the least expensive program, the Internet Mastery Silver Momentum Membership for $97/month simply because NOT knowing this is costing you MORE than $97/month in lost sales, leads and FREE traffic. If you’re keen to improve by MORE than 1 percent, you’ll want to check out another Linked In strategy I highlighted on www.AustralianBlogs.com.au that explains how to post your blog on www.Linkedin.com. As you can well see, each 1 percent improvement on its own is quick and easy. The thing is that it all adds up to FREE traffic that ends up buying from you BECAUSE they know you exist and have something of value to offer. If they don’t find you, they can’t buy from you. Published on November 22, 2008 in Blogging and Traffic. 0 Comments Tags: 1 percent improvement, Blog, Blogging, Lead Generation, Marc Dussault, Posting Comments. Click here if you’re in business and want to grow your business quickly even with a shoestring budget. Click here if you want to achieve Personal Mastery and unlock your Exponential Potential™. Click here if you are into blogging for profits. I am a contributing blogger on www.AustralianBlogs.com.au. Click here if you want to get the Best Business Results With The Least Amount Of Effort. I don’t duplicate the content I post and make sure each post is congruent and relevant to the target audience of that blog. I suggest you subscribe and determine for yourself if you want to have that ‘conversation’ with me and choose to opt-out rather than not opt-in and miss out on what could make a difference to you. This is my 1 percent improvement for today. Of course my ADDITIONAL 1 percent improvement over the next few days will be posting this message on my other blogs so the readers of those blogs know about this one! What can YOU think of that some of YOUR clients might not know about what you’re up to? It’s the easiest and fastest 1 percent improvement you can do right now to improve your results. The NEXT 1% is to get MORE TRAFFIC to your site by posting comments on my blogs. This is TOTALLY free. When you do add these comments, make sure you include a backlink to your site that people can click on to see what you’re all about. Make sure this backlink is formatted as shown below. Don’t make the comment a self-serving advertisement – ADD VALUE to the original blog post so that the reader APPRECIATES and ACKNOWLEDGES your point of view and WANTS to check out who you are. If it’s a blatant ‘ad’, (1) I won’t approve it and (2) no one would click through anyway. That is NOT exponential. Remember the cornerstone principle of an Exponential Mindset™ – Create and GIVE MORE VALUE and you will be rewarded. If you violate this principle, you’ll waste time and simply won’t get any momentum started. Be a LEADER which means LEAD BY EXAMPLE – do what works and be generous. Published on November 4, 2008 in General and Long Tail Niche Marketing. 1 Comment Tags: 1 percent improvement, Growth, Internet, Internet Marketing, Internet Mastery, Internet Millionaire Marketing, Lead Generation, Marc Dussault, More Sales, sales, Search Engine Optimisation, SEO, Traffic. I recently uploaded two YouTube videos that are ‘product’ description videos for my Marc-Ka-Ching Kube™, definitely a long tail niche marketing product. 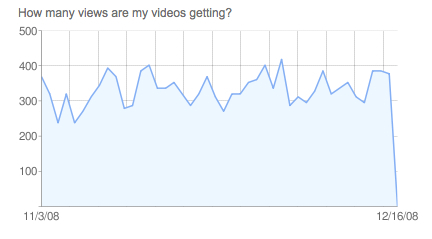 BEFORE I even posted the videos on my site, there were 16 views of the first video with NO effort at all. The second one is a ‘non-publicised’ video for people who buy the Marc-Ka-Ching Kube™ that IS public on YouTube. Having people automatically view videos is pretty cool by itself, but more importantly what the video does for me is increase the visitor experience ON THE PAGE. A 21 second video increases the visitor experience by orders of magnitude. Search engines such as Google love that. They know that if people stay on a page LONGER, it’s a BETTER PAGE = a higher ranking. Bottom line, every 1 percent improvement counts because it adds up at the end of the year! Did you know that 5% of Internet Marketers make more than the other 95% COMBINED? It’s a startling statistic, one that you can reverse for yourself by attending our Internet Millionaire Marketing Event in Melbourne on Saturday 6 December 2008. This blog has lots of FREE advice, imagine what I can teach you in a full 8-hour day! Published on October 17, 2008 in Tools. 2 Comments Tags: .com.au Domain Names, 1 percent improvement, 1%, 1% Improvement, Cheap Domain Names, exponential, Exponential Marketing, Internet, Internet Tools, Marc Dussault. I’m not sure you know that you can purchase .com.au domain names for $36.50 for 2 years from www.ireckon.com.au. The reason I am telling you this is because a friend and client was feeling ripped off by a Melbourne company trying to sell him the SAME thing for $140…! That’s it. That’s my 1% for today! For fun, Google “1% Improvement” and see what comes up in the #1 position… Watch the YouTube video if you haven’t already – that’ll explain why 1% might not seem like much, but it’s totally exponential!